2. Show Me How! has received another lovely review…this time from Beth Stilborn, fellow 12x12er, and PPBF participant. If you’d like to see what Beth had to say about it, please click this link. If you’ve never been to her blog, By Word of Beth, hurry over…you’ll be glad you did…her posts are funny, informative and not-to-be-missed! 3. Earlier this year I connected with a children’s author in Singapore, Emily Lim. It was just before their big Asian Festival of Children’s Content, where kidlit publishers, editors, writers, illustrators, educators and all who are involved in helping kids become loves of books and reading meet for conferences, workshops and fun. As Emily and I chatted via email, she mentioned that she wished I could be part of the conference. I couldn’t believe my eyes when I opened my email yesterday morning and saw an invitation from her (she is on the Children’s Writers and Illustrators Conference Committee) to speak at the conference! What a great honor…I don’t know if I will be able to attend…but I hope we can work it out. Is it Perfect Picture Book Friday yet? You’ve all been so patient…so to reward you, you will be getting TWO FOR THE PRICE OF ONE! October is National Bully Prevention Month! I’ll be highlighting some amazing books and other resources for the next four weeks. Did you know that 13 MILLION kids…over one-third of all school-age children, are bullied every year? I encourage anyone who is involved with kids to visit the website at http://www.awesomeupstander.com. There are free downloadable info sheets for parents and teachers that address positive action plans for kids and adults. You can follow Awesome Upstander on Twitter or on Facebook. You can also purchase the download for iTunes or Android. This concept of group dynamics brings me to…FINALLY…my Perfect Picture Book Friday pick. You will need: 1 piece of construction paper, crayons or markers, blue food coloring and a brush. 1. 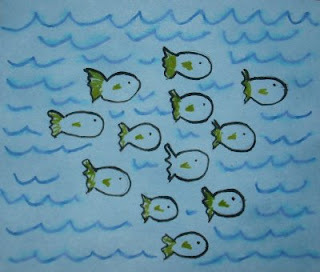 After reading the story, let your child draw a picture depicting his favorite underwater scene. 2. Mix a drop or two of blue food coloring (you can use non-toxic blue watercolor paint) with some water. 3. Your child can brush the watercolor wash over the entire picture…when it dries, it will have an underwater look to it. 4. Hang it up in a place of honor in the house! You can also make a fish mobile…with a bunch of little red fish and one little black fish. This entry was posted in Asian Festival of Children's Content, Bullying and tagged Awesome Upstander app, Bullying, children, children's author Susanna Leonard Hill, HealthTeacher, Leo Lionni, Perfect Picturre Book Friday by viviankirkfield. Bookmark the permalink. Thank you, Tracy…the app site is great because it provides some effective action plans for parents and teachers. This book sounds excellent, as does the app — it’s so important to have resources that will help kids deal with bullying. Congratulations on the invitation to speak at the conference! And thanks for the shout-out for my blog. Beth…you deserve any shout-outs I can give you. 🙂 Glad you liked the book and app…it’s a topic that needs to be shouted out as well! Thanks Vivian for sharing the fantastic app to help kids deal with bullying. A great way to empower kids! May I link to your page? Also enjoyed your review of Swimmy. The cover and content both grabbed my attention. Enjoyed your activity. Congratulation on the invite to speak a the Asian Children’s Conference in Singapore. That’s a big deal. I chat with Myra Grace from Gathering Books and she’s involved as well. They are doing great work with creating a children’s literature program. Your angle would be significant. I appreciate your kind words, Pat. When Emily did her posts about this year’s AFCC, I did see Myra in some of the pictures. 🙂 The app seems to be encouraging kids to stand up for each other…maybe this will catch on and they will do it in real life. 😉 Glad you liked the book…Swimmy is one of my all-time classic favorites. Pat, you never need to ask if you can link to my page…it is awesome that you want to…of course you can!!! This book is a classic, Vivian…I love it…and the wonderful illustrations. Thanks for sharing it! I love this book! 🙂 It is awesome! Great choice! 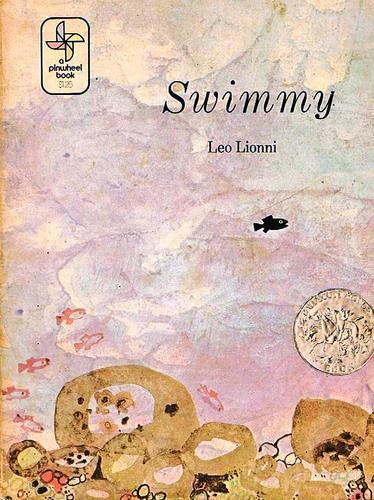 I love all Leo Lioni books. I love the simplicity of the illustrations and the text. I didn’t realize Swimmy had won him a Caldecot Honour Award. I love this book too, lovely choice, Vivian. I just ordered Swimmy from the library, so thanks for the recommendation. Schools seem to do a lot when it comes to bullying but I’m not sure the negative consequences are enough to stop bullies. In my personal experience, many bullies suffer from abuse at home and never get the help they really need. They just get punished for their agressive behavior and their anger only builds up. I wish our system was more supportive and not just suppressive. Swimmy is such a beautiful and empowering book. Together we can keep the big fish at bay and explore the world.